The Grail. For every watch collector, there is a ‘grail’ watch. The one watch you have wanted for years, but could never justify the expense. Some collectors shoot so high, they will never own that Rolex or Bell&Ross. Me, I fell in love with the Seiko SARB017 Alpinist. By no means a ‘luxury timepiece’, but still significantly higher priced than what most people would pay for a watch. In this case, a little under $400. For years I pined for this watch. What made me pull the trigger? Well, to be honest, I just left a job I spent 10 years at. 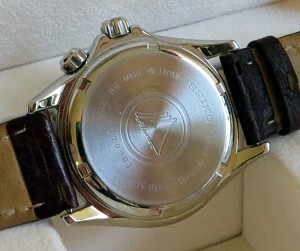 If I stayed on till later in the year I would of received an anniversary watch, but I know it was just a quartz watch. Nothing I would pick for myself. So this is a reward for finding a new position (that I really like so far) and actually having enough wherewithal to actually go through the whole process of changing jobs. Enough of me, on to the watch. The dial. The dial of this watch is what really makes it. A sunburst emerald green shifts in color with different lighting. In all my years of watch collecting, I don’t think I have ever encountered another emerald green dial. The markers are gold plated, Arabic at the even hours, triangles at the odd hours. Very easy to see. The minutes chapter ring is white with 1/6 of a second tic marks, with luminous pips on each hour. The outer chapter ring is a compass that is turned with the crown at the 4 o’clock position. It turns easily and north is marker with a red arrow. 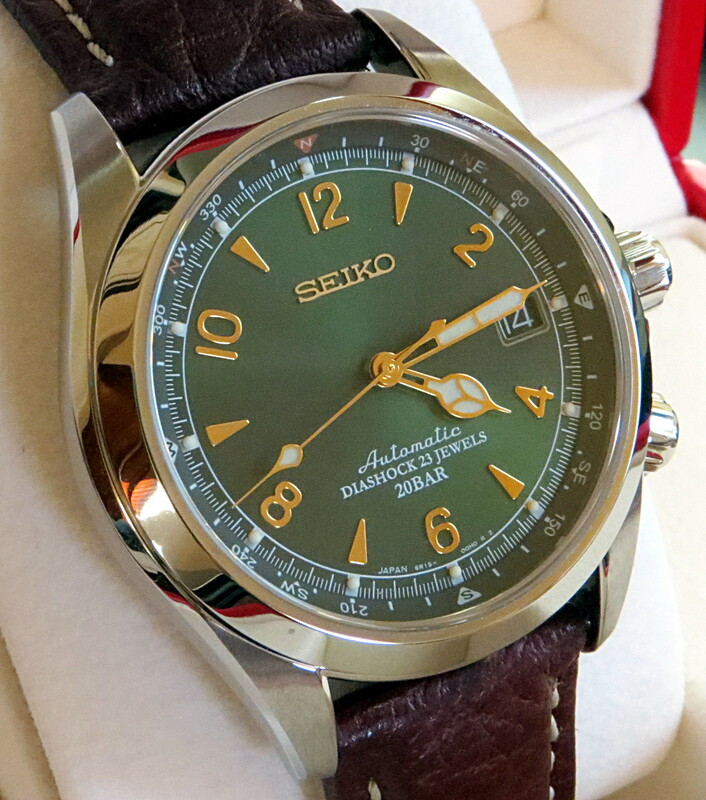 A gold pated Seiko is at noon, and Automatic Diashock 23 Jewels 20BAR is at the six o’clock position. The date is displayed at the traditional 3 o’clock position and has a black background with white Arabic numbers. The dial is not cluttered at all and has a field or military air to it. The hands are cathedral style, very traditional and have a healthy coating of luminous material. This watch has very good lume and appears to have a high grade of lumibrite, that glows for at least 4 hours. It rivals my Seiko Diver’s and Omega. The crystal, bezel, and case. The crystal is sapphire and flat with anti-reflective coating. As you can see in the photo above, it is almost invisible in some light. 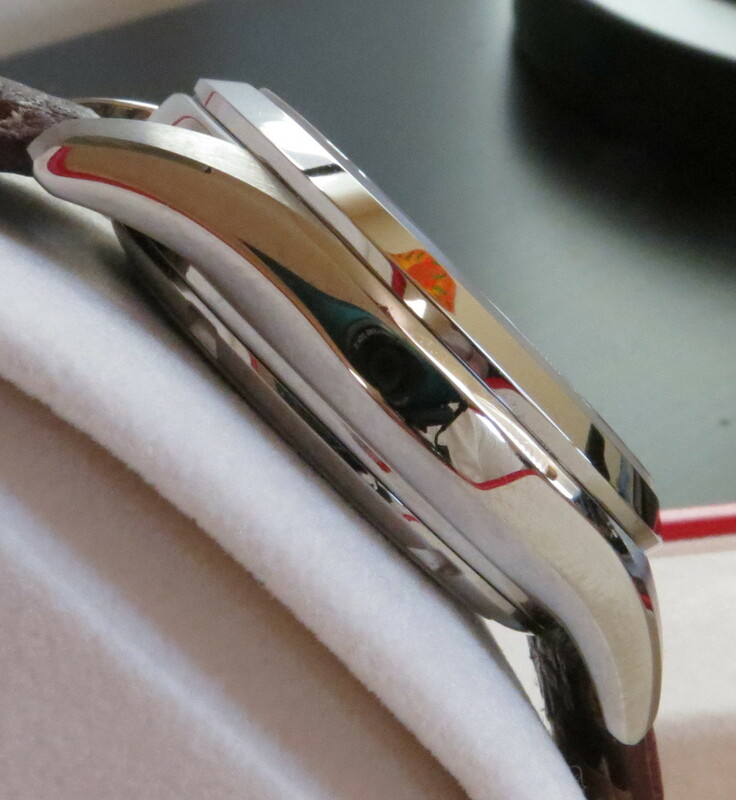 The bezel is a high polished stainless steel and is chamfered to 45 degrees. The crystal is about the thickest sapphire I have ever seen. This is probably due to the 20 bar water resistance rating. That’s right, it is a sport watch that you could swim and dive with. 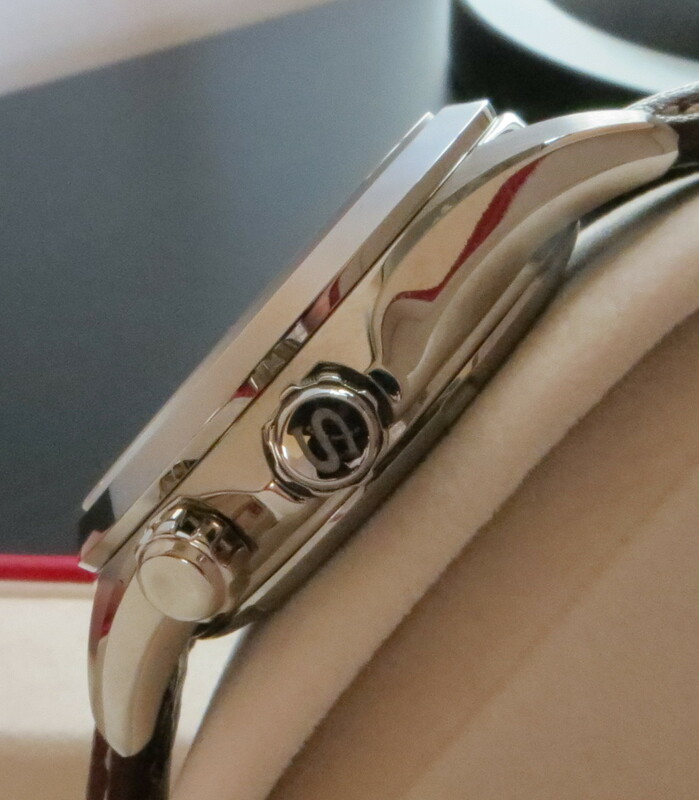 The case is a classic ‘oyster’ style with down turned lugs. The fit and finish are nothing less than amazing. The crown is at the 3 0’clock position and is signed, deeply, with an S. It is a screwdown and threads and unthreads easily. The crown at 4 o’clock turns the compass bezel. Both crowns have deep teeth and are easy to turn. There are no hard edges and the polish is about the best I have ever seen. All stainless steel, of course. Even on leather, the watch feels quite substantial, and feels like a diver’s watch. The lugs are 20mm, so a lot of options when it comes to straps and bracelets. A word on the included band. I have to agree with other reviewers, it is pretty awful and I just don’t understand what Seiko was thinking. I replaced it immediately with the calf skin strap seen in the photos. I also added a deployment as well. You can get it on a oyster style bracelet, but I like the look of leather. Case back and movement. The case back is solid, as with every Japan domestic model Seiko I have encountered so far. The center is embossed with the Alpinist logo with 3 mountains. The watch is Made in Japan and is the first Alpinist made in July of 2014. It has a 0001 serial number. The case is this and heavily built and the watch wears much larger than the 38mm diameter would lead you to believe. 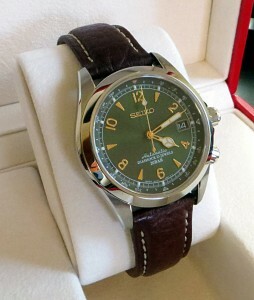 The movement is Seiko’s mid grade 6R15 with 50 hour power reserve. Considering it only has one spring barrel, that is a lot of power reserve. Right now it is running about -4 seconds a day, which is acceptable for any mechanical watch that is not chronometer rated. The movement also hacks and hand winds. It has 23 jewels, anti-magnetic, and has Seiko’s Diashock protection. With the exception of the included band, the watch is nothing less than amazing. I have worn it almost every day and quality wise, I would say it rivals my Omega. It exceeds the Omega for water resistance and the lume is just hair better as well. The accuracy out of the box is excellent and everything about it screams quality and attention to detail. It is easy to get lost just staring at the green dial. It can be worn with a suit or a t-shirt, so a great everyday wear watch. It has a style that only borrows the oyster case, but little else. Everything else is all Seiko style. I really love this watch and I feel like it was money well spent. Case: 38mm diameter, stainless steel, 20 Bar water resistance. Back: Stainless Steel, screw down. Movement: Automatic, 6R15, Seiko in house design, Japan Made. Hacks, hand winds, 50 hour reserve. 21600 BPH. Other: Luminous Hands and markers.